With Miss H starting school in September, it has been on my mind for a while what she will need and how much of it. 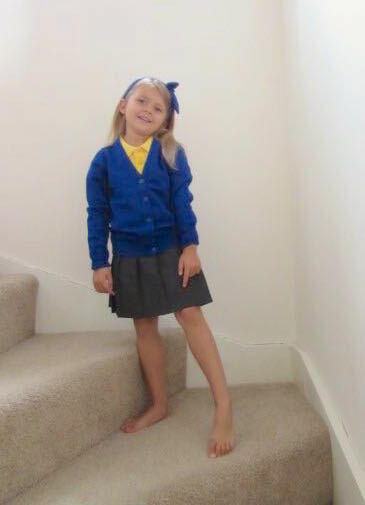 When you have never had a child attend school before you're not quite sure how many skirts or shirts to buy and even where from to make sure you are not bankrupting yourself on uniform, but that what you do buy will last at least until the next growth spurt. 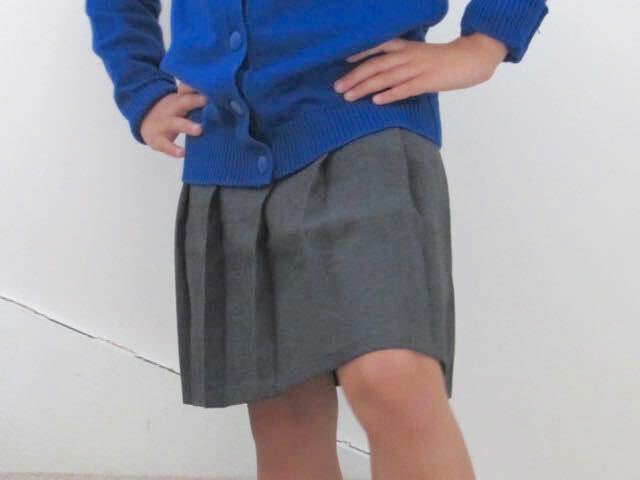 When Trutex offered to send H some of their school uniform to try I thought it would be a great opportunity to get a feel for quality and style of uniform and maybe give me a bit of a push to finally make those first steps into the next chapter: schooldays. 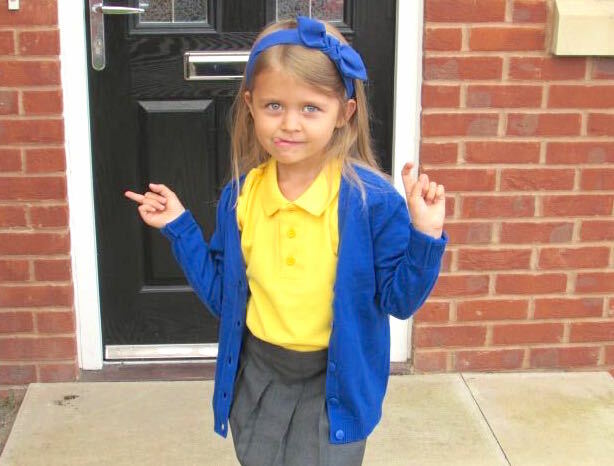 Miss H was sent a polo shirt, skirt and cardigan to try out. 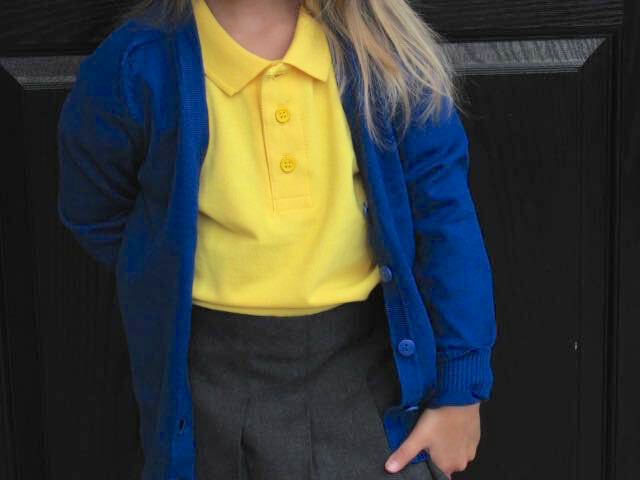 I chose each item from their online store and ordered them in her new school colours - yellow shirt, grey skirt and royal blue cardigan. It's a lovely bright combination and I have to say they really suit H's olive colouring. Trutex are a brand that have been around for many years and have a great reputation for quality that lasts. In fact I believe my own school shirts all those years ago were Trutex! That reputation is not wrong and the items we received are lovely quality. 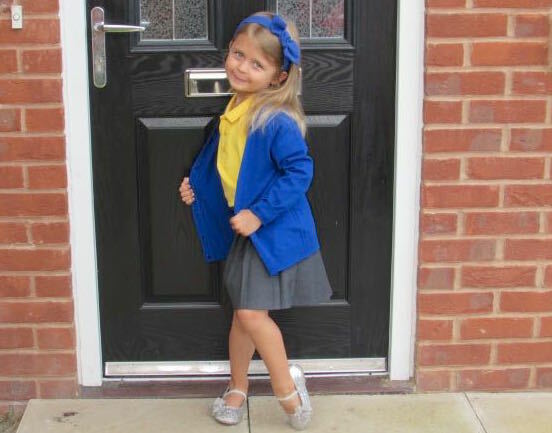 You can certainly feel the thickness and be certain that it will be hardwearing throughout all the rough and tumble Miss H will no doubt take part of in her new school. The skirt has an adjustable waist, which was not needed for the size four years I chose for her. I did go for 5-6 years for the cardigan and polo shirt, though, and whist they don't swamp her they do have lots of room for growth so will hopefully last. It's a proud mummy moment watcing your first-born don her school uniform for the first time and cast your mind back over the last four years. So much has changed and we have been blessed over and over. I know my little lady is more than ready for her next adventure, she just needs mummy to catch up with her. You can visit their site for more information on Trutex and to find your nearest school uniform stockists. *We were sent these pieces FOC however all opinions are my own.